Forget the throngs of tourists, well, for a while. I was alone at this Peruvian fortress in the north of Peru. A new gondola may change all that. Story appeared in The Globe and Mail. Part cloud forest and part tropics, Kuelap is like a new world for a lover of unusual and distinctive places like Melanie Chambers. The taxi climbs endless switchbacks until we’re level with the clouds. Then, after a two-kilometre walk to a breathless elevation of 3,000 metres, I’m a speck against the ancient and dramatic 20-metre-high stone walls of Kuelap, dubbed the Machu Picchu of the North. Not much is known about the mysterious ruins or the Chachapoyas, the Cloud Warriors, who lived here in the northern Andes almost 800 years before the Incas. Feeling like the walls are closing in as I walk through the narrow west entrance, I pass under giant red bromeliad flowers and twisted mossy trees busting through the stones. The site was discovered in 1843 – abandoned after the Incas conquered the Chachapoyas before the Spanish arrived. Much of it was damaged by poor water drainage, fires and wind erosion. In 2004, Kuelap was put on the World Monuments Watch list. Much of the ruins in the region are steadily deteriorating and still unknown to travellers – even to locals, as I discover. Bookended by a rain forest to the east and a canyon to the west, this unrestored and quiet area, part cloud forest and part tropics, is like a new world for a lover of unusual and distinctive places. But that will soon change. In July (local workers predict that it will be more like October), the region will open a high-speed gondola from the village of Tingo Nuevo. It will take 20 minutes to reach Kuelap, compared with the current hour-and-half drive or four-hour hike. My guide and two others are the only ones here today; at last count, llamas outnumber us. Eating my lunch alone in silence, as the others explore, I peer over the wall into the Utucumba Valley: The green peaks burst through the clouds. With more than 41,000 visitors annually, compared with Machu Picchu’s 1.2 million, Kuelap provides solace that you won’t find in the more famous site. 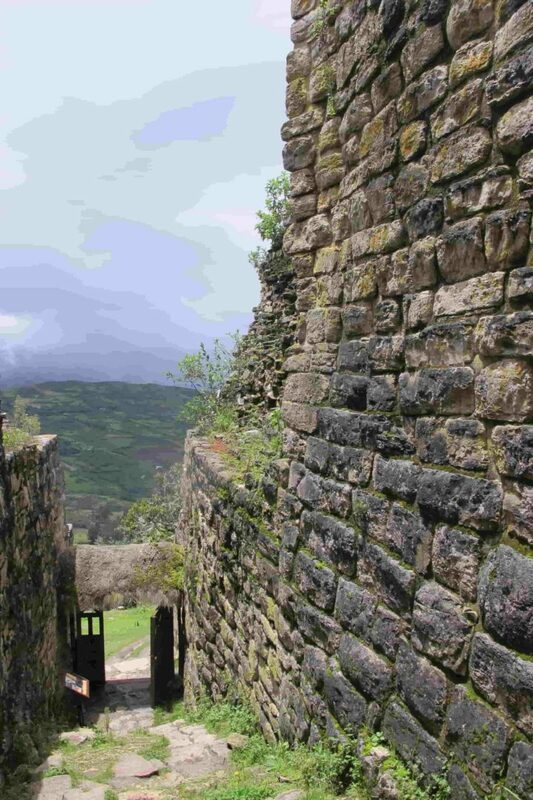 But Kuelap, built between the sixth and 16th century, came first. The limestone rocks, some of which are 10 times the volume used in the Giza Pyramids, are formidable. It’s easy to see why some historians believe it was a fortress. Detail of some of the intricate stonework found on the walls. “Many people think this, but it was a ceremonial place. It was the most important ceremonial centre of the Chachapoyas people,” says Jose Llaja Soplin, a guide with Chachapoyas Backpackers.He explains the theory. Alfredo Narvaez, an archeologist and head of Kuelap’s excavations, discovered more than 80 bodies underground in the southern part of the ruins in 2007. He also found ceremonial items from other Peruvian cultures buried with the remains: stones from Paracas (south of Lima) and shell figurines from the north. “We know that the Chachapoyas people had relationships with other cultures,” Soplin says. Circular homes were also among the 400 structures at Kuelap. Inside, you can see fire pits and giant mortars for crushing herbs – even deep pits used to bury family members. Human remains are ubiquitous throughout the ruins. In the centre of the 600-metre-long site walking beside a wall, Soplin removes a stone and beckons me to look inside: a skull and femur. But the real gravity-defying head scratcher is the inverted temple called El Tintero – the Ink Pot. Even more perplexing is a cute little face on a corner stone. “Maybe it represented a god,” Soplin says. The Chachapoyas also decorated many of the structures with beautiful artistic triangular and diamond-shaped friezes thought to be symbols of fertility. But the mystery isn’t surprising: The entire area had been forgotten for quite some time. Until 1960, there wasn’t a road from Cajamarca to Chachapoyas, the capital of the Amazonas region, or Chachas as the locals call it. It’s still only a dirt road. Many of the ruins are a bit tricky to get to. But that isolation is part of the charm. From Chachas, most ruins are a few hours’ bus ride. In the Plaza de Armas, the main square, tour companies abound. Kuelap is cheaper than Machu Picchu: The cost of a guide and entrance fee is about $35 to $40 (Canadian), compared with $170. Most travellers, or even locals, haven’t seen the ruins of Yalape, second in size to Kuelap. I hire a taxi one day to make the one-hour drive. “Donde esta? Yalape,” he asks the farmers en route. We stop five times for directions. Thrashing through the brush and thorns, I’m crawling on the ground at one point. But it’s a thrill when a section of a stone wall appears through the forest – some walls have the iconic trapezoids or zigzag decorations. It feels like I am the first to discover this place. After the bush-whacking, we find a restaurant in Levanto. Ducking into a dark stone room with plastic chairs and only men, I treat my taxi driver to soup and a plate of chicken accompanied with slivers of Spanish onions, rice and beans and, of course, the popular purple-corn drink chicha morada. All for less than $5 soles ($2 Canadian). Forget tourism inflation. It’s harder to get more off the tourism grid than Yalape, but the town of Leymebamba during rainy season (November to April) is close. It’s a squishy two-hour combi (van) ride from Chachas. Leymebamba is also an archeologist’s dream: In 1997, 219 mummies were discovered 100 metres above the Laguna de los Condores; travellers can hike three days from Leymebamba to see the site. Today, the actual mummies are stored in the Leymebamba Museum. My guide turns on the light to a temperature-controlled room: mummies, hundreds of them, some with exposed faces in disturbing expressions and some in smaller bundles (children). Other mummies have simple faces sewn on the cloth. Landslides make it impossible to hike to the lagoon to see where they were found, so I opt for a day trek to La Congona, which is three different ruins through undulating dirt paths and farmer’s fields. After an hour’s drive from Leymebamba, my local guide, Sinecio, and I begin walking over mucky rocks. Sinecio holds my hand to guide me. “Mucho illuvia [rain] ayer,” he says. From the road, we enter the dense forest. He expertly slashes the overgrown ferns and vines with a machete, Indiana Jones-style. Coming onto the ruins of Molinete, a woman hobbles through a wooden gate: “Five soles,” she yells. Two of the ruins are on private property. I mistake her yelling for meanness. Moments after I pay, she goes to her home without saying a word and quickly returns with a hot cup of milk, fresh from her cow. “Ven,” she beckons us. For an hour, we eat rice and beans, and listen to her talk. She appreciates the few travellers who come by. Saying goodbye, we hike a few more hours through grassy meadows. Eventually, we reach another mud trail, and soon have to jump aside for a horse and owner barrelling down the path. Into the forest again, Sinecio slashes his way through some brush to reveal a round stone home with two levels. We walk the narrow steps for a view of the valley. With no person in sight and the patches of green farmland below, I feel connected to this ethereal world. There is no direct flight to Chachapoyas from Lima. You could fly to Tarapoto ($230 CAD), then take a flight to Chachas (about $27) on a nine-passenger plane. Or you could take an hour-long local bus from Tarapoto to Pedro Ruis, then a seven-hour ride to Chachas on a Movil Tours bus (moviltours.com.pe). Or you could fly into Chiclayo ($200). The problem with Chiclayo is that there is only a night bus available, arriving in Chachas at 6 a.m. Bring earplugs. If you want a bit of luxury, the Gocta Andes Lodge (goctalodge.com/gocta-en/) in the town of Cocachimba offers views of Gocta Falls, in addition to a beautiful infinity pool. The rooms are spacious. A king-bed suite (365 soles/$142), or a double with two beds (265 soles/$103) includes a continental breakfast with local cheese and eggs. The on-site restaurant also serves all the Peruvian favourites, such as lomo saltado (strips of sautéed steak, Spanish onion, tomatoes and garlic served with rice and home-cut French fries). And taste the amazing craft beer Sierra Andina from Huaraz (sierraandina.com). It’s worth staying in Leymebamba just for the cozy bed and breakfast La Casona (casonadeleymebamba.com). A queen bed runs about 120 soles ($47). Walk from a dark entrance into a flower-filled courtyard. The walls are full of family pictures, and memorabilia. Breakfast is killer: fresh-pressed cheese and espresso, instead of the instant coffee that is pervasive throughout Peru. The owners will also arrange local guides. A trek to the three ruins of La Congona runs about $120 soles ($47). In Chachapoyas, the Villa de Paris is about a 10-minute walk from the centre of town, but is a quiet retreat from the noise. Furniture and decor are dated, but the clean rooms (double for $100 soles/$39), flower gardens and insensia (concentrated coffee) make up for it. Another must-do in the area is a two-hour hike to Gocta Falls, reputedly the third highest in the world, but actually the 16th highest. The giant gush of water splashing on the rocks below is quite heart-grabbing. Starting in the town of Cocachimba, about an hour by taxi from Chachas, the hike is a serene walk through ferns and cloud forest. After paying 10 soles ($4) at the tourism office, begin a steep climb down and then back up. About halfway to the falls, there is a cute little restaurant if you need a snack. For the hard-core trekkers who want another two hours almost entirely up, veer to the left (bring a map) about 20 minutes before the base of the falls, which takes you about three-quarters of the way up. The last section is by ladder. There are amazing views of the village and valley below. Be careful: The mist from the falls makes for slippery walking. Baseball is back. Will America’s game reclaim its political power? Your number one partner for reaching Canada’s Influential Achievers.